Is one of the best new restaurants in the world being built right now in Chicago? That&apos;s the consensus of the league of worldwide culinary watchers, including yours truly. Curtis Duffy, chef/owner of the highly anticipated restaurant Grace visits The Interview Show by Mark Bazer at The Hideout, with business partner/wine director Michael Muser. Duffy won two Michelin stars at Avenues at The Peninsula, and when he left he said he was shooting for three. I could see his eyes on that prize when I first met him in 2004, way back when he was Grant Achatz&apos;s pastry chef at Trio. Watch Duffy previously on The Interview Show, where he talks about finding grace in food before he ever announced Grace. Admission $8. Were tacos invented by Mexican silver miners as late as the end of the 19th century? Jeffrey Pilcher thinks so. 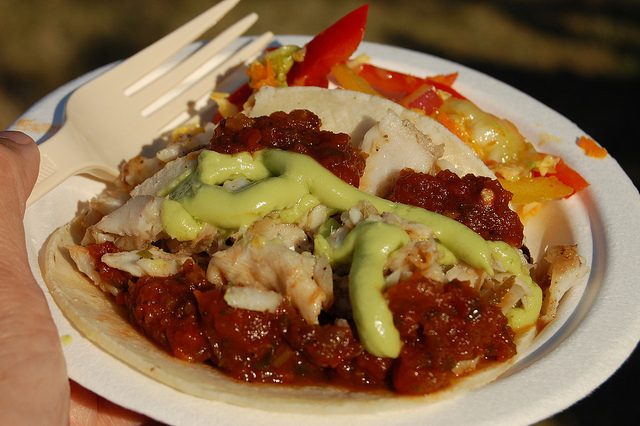 He explores Taco World: A Global History of Mexican Food at Kendall College, hosted by the Chicago Foodways Roundtable. Pilcher&apos;s newest book, Planet Taco: A Global History of Mexican Food, was just released Monday. He&apos;s investigated the history, politics, and evolution of Mexican food for the past 20 years and is a history professor at the University of Minnesota where he teaches history courses in Mexican and global food and drink. My friend and Roundtable founder Cathy Lambrecht says Enchiladas Picadillo will be served. This event will be recorded for WBEZ’s Chicago Amplified but you&apos;ll need to attend to taste those enchiladas. Admission $3, FREE for Kendall students and faculty with ID. Is Indiana the next cool culinary destination? I know I can&apos;t wait for next year&apos;s Maple Syrup Festival in Medora. At the weekly thought and talk provoking Re-Thinking Soup at the Jane Addams Hull-House Museum the topic of the day is the book Food For Thought: An Indiana Harvest. In this big beautiful collectible we meet more than 80 food renaissance Hoosiers, including Greg Gunthorp, whose chicken, pork and duck get namechecked on menus across Chicago; Judy Schad who makes the ethereal Capriole goat cheese; and the one and only Tim Burton of Burton&apos;s Maplewood Farm. Author David Hoppe and photographer Kristin Hess will be there to discuss their year making the book, and maybe tell us how we can get one done in Illinois. A local, seasonal soup will be served with bread by Nicole&apos;s Divine Crackers. Admission FREE. Have you ever dreamed of escaping your cube and living off the land as a sustainable farmer? Harvest Feast Chicago at the Greenhouse Loft, benefits the Spence Farm Foundation, whose mission is to teach the art, history and practice of small sustainable family farming across America. A four-course dinner by Rick Bayless of Topolobampo, Frontera Grill, XOCO, et al. ; Mindy Segal of Hot Chocolate; Paul Virant of Vie and Perennial Virant and Daven Wardynski of 676 Restaurant and Bar. Only $25 more gets you in to the VIP cocktail hour with tastings from Ashlee Aubin of Wood, Paul Fehribach of Big Jones, Cleetus Friedman of City Provisions, Jonathan Goldsmith of Spacca Napoli, Thomas Leavitt of White Oak Gourmet, Chris Pandel of The Bristol and Balena, and Marianne Sundquist of Mess Hall & Co. Admission $125 dinner only, $150 VIP tasting and dinner.